Pathik Baxi is a Partner with Simmons Da Silva LLP where he is a key member of the firm’s Civil and Commercial Litigation Practice Group. With an emphasis on resolving complex commercial disputes, working closely with clients, providing general counsel and other external counsel across multiple jurisdictions within Canada and internationally, Pathik prides himself on achieving desired legal outcomes within set timelines and facilitating cost-effective resolutions. 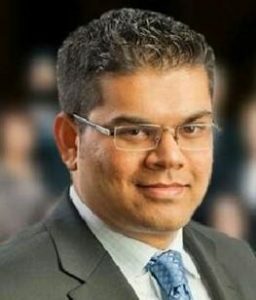 As a litigator for more than a decade, Pathik is experienced in managing all phases of litigation through to trial and has acted as counsel before Canadian trial courts and various alternative dispute resolution forums. Of note, Pathik has advocated on behalf of clients in matters before the Court of Appeal for Ontario, Divisional Court, Superior Court of Justice and the Federal Court of Canada. Dedicated to his community, Pathik is an active volunteer, currently serving as legal advisor for several charitable institutions, not-for-profit organizations, media outlets and other community-based support groups. He was the Vice President and Corporate Secretary of Indo-Canada Chamber of Commerce. He is fluent in English, Hindi and Gujarati. Pathik is a graduate of the Osgoode Hall Law School of York University, Ontario, Canada, and was called to the Bar of Ontario in 2004.